Rev H. H. Thompson was pastor from 1898 - his first charge since leaving Rawden College. 1907 when he removed to Darlington in 1907. 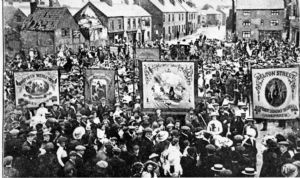 Under the auspices of the Shepshed branch of Citizens’ league to protest against Education Act, on 20 August 1903 people assembled in the Bull Ring, they marched to Market Place and then to British Schools. The meeting was presided over by Mr Chas Mee; Rev H H Thompson and other Non-Conformists spoke - so also did the vicar. The Annual Meeting of congregation on 11 February 1904 “regretted that numbers of members have this day been summoned before Loughborough Magistrates for conscientiously objecting to payment of education rate”. On February 14 1905 eighteen people were summoned for non-payment of sectarian portion of rates since May & November 1904 - Non-Conformists & Rev. H H Thompson - said they had paid poor rate but not education rate. On 28 June 1906 thirteen Non-Conformists were summoned for non-payment of the rate - Rev H H Thompson among them. Although we do not have much more information about his pastorate here the Sunday Schools extended to double the size, and membership was largely increased. Rev Thompson was a great help in Adult School life. During 1905 new schoolrooms had been put up and extended at a cost of £800. . Rev H H Thompson gave notice in 1907 and removed to Darlington. The Rev. A. E. Pope undertook the charge some six months later in 1908. For a considerable time the question of removing the old straight back seats in the chapel and replacing them with some of a modern type had been considered, and the scheme was taken up in real earnest. The question of proposed renovation & reseating of the chapel was brought forward for consideration. The pastor stated that following Deacons meeting held on 3rd October 1910 where the matter had been discussed it was recommended to the church “That we are of the opinion that it is time to definitely consider the scheme of Chapel Renovation & Reseating.” On the proposition of Mr A Chester, seconded by Mrs G Wade, it was heartily agreed to. Mr J Harriman, the chairman, gave a detailed report of the scheme at a special meeting on November 28 of the church & congregation for the purpose of considering the plans of proposed alteration to the chapel and also the reseating and renovation. This included the building of an entirely new front to the chapel, the removal of the stairs leading to the gallery, the aisle to be laid with blocks, new pulpit and the whole of the interior to be re-seated, decorated and painted. Following a display and explanation of the plans, Mrs Harriman proposed and Mrs W Briers seconded the acceptance of the plan and it was carried unanimously. In January 1911 tenders for the work had been considered and that of Messrs Atkin Brothers of Shepshed for £923 was accepted and the work put into hand - hoping to be finished by Whitsuntide. The work, by Messrs Atkin Bros. and Mr G W Blood, was carried out in a satisfactory manner. The total amount actually received towards the work prior to the re-opening came to £462 16s. 6d towards the final cost of £1048. At the re-opening service on June 8 1911 Mrs J Harriman re-opened the church and was presented with the key by architects Barrowcliff & Allcock. It was reported that Mrs Harriman had very kindly defrayed the cost of the carpet for the Communion platform and the stairs & pulpit platform. Reference was also made to the gift of chairs and table by the Sunday School. Centenary services for the Sunday School were held in 1916 and 200 scholars received a copy of the Sunday School Hymnary to celebrate the occasion. Farewell services were held in May 1917 when Rev. Pope left the church. Rev T Roberts from Fleckney became pastor in December 1917. On 13 February 1919 120 scholars joined the Roll of Honour; 20 had been killed in the 1914-1918 war. During 1920 - 1923 several concerts, teas, sales of work and a garden party were held to raise funds towards a memorial organ in memory of men in 1914 -18 war. General Booth of the Salvation Army also visited for an evening service in June 1923. Rev Roberts left us in February 1923 to go to Ealing. Rev R T Anderson, from Guiseley, became our pastor in May 1924. After 5 years of effort the new organ was installed and the opening took place on 25 June 1925 t a cost of £1068. The old organ was sold to Long Whatton Baptist Church for £70. In May 1928 it was agreed that an electric blower be acquired for the new organ and concerts arranged to raise funds. In 1929 a wall was built to replace the wooden fence at Manse. In July 1930 the Deacons and the Church meeting agreed to replace the gas lighting with electric. 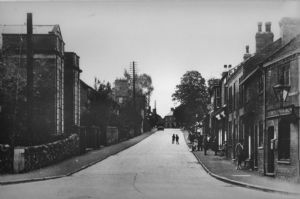 May 1932 saw a weekend of very heavy rain that caused the brook to burst its bank, burst a wall and flood into the schoolroom and minister's vestry. A claim was made against the council as it was considered they were responsible in as much as the brook had been covered in and a grid placed over the opening which had become blocked. Further a wall had been erected which undoubtedly prevented flood water running away and consequently the church rooms had been flooded. It was also pointed out that although the building had been standing for 100 years no previous downpours had caused any trouble. However the council repudiated all claims. 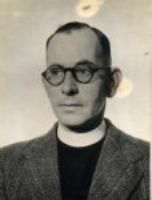 Rev Anderson resigned due to ill health at end of June 1932. Rev. F G Parker of Arkwright Street Baptist Church, Nottingham commenced his pastorate with us on 26 October 1932. At this time the membership was 180 - 200 and the stipend was £200 p.a. with free manse. Before he moved in, the manse was redecorated throughout, an inside toilet and electricity installed. 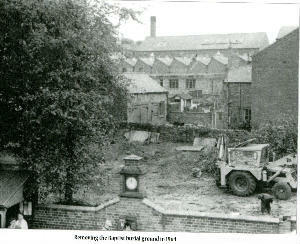 The unsatisfactory state of the graveyard in the Bull Ring was raised in March 1933 and discussed at length with the Pastor agreeing to see the remaining relatives of those buried there in order to obtain permission to remove the stones to the side, then level the ground and grass could be grown and suitable flowers planted. The gate would be repaired and the elderberry and lilac trees taken away. in June 1933 the land adjoining church was cleared of rubbish, dug up and the future of the land was considered. The Sunday School and Sisterhood were not happy at being overcrowded by the occupation of those rooms by Miss Merriman for her private school. It was decided to give six months notice as it was thought that the work of the church was being stunted for the sake of a few shillings rent per week and the real benefit was going to private interests. It was thought there were 229 members at that time. On 5 May 1934 the Centenary of chapel was celebrated with services, meetings and concerts covering the week. Mr M Smith had consented to write a short history of the church for the handbook to be prepared. Everyone had taken a keen interest in the celebrations and the crowds that had gathered were an indication that we had stirred up the neighbourhood. June 1934 The state of the organ had been causing concern for some time. Experts had been called in to give an unbiased opinion. It was found that although there was nothing seriously wrong with the organ the problems were caused by the electric blower as it was encased by hot pipes running through the chamber. As a result hot air had been regularly drawn into the organ and it was a wonder much more damage had not been done. in November the first Sisterhood Sunday was held and was a great success - in the last year the membership had grown from 49 to 87 members. During 1936 there was great dissension between the Sunday School and the Church. For many years the Sunday School had been run entirely separately from the Church and Rev. Parker did not agree with this situation. Following several heated meetings and letters to those concerned a split occurred between the Sunday School and Chapel causing much unpleasantness between officials and congregation. The Sunday School treasurer was refused entrance to the buidling and 10 teachers were releaesed from their duties. Several others left chapel too. About this same time Rev Parker set out his plan for reforming the choir, with tests to ensure the participants could sing!! He left the church in 1945. Rev W A Hinder became our pastor in 1946. During March 1949 the question of nominating women to the diaconate was discussed and it was decided they could be nominated with the church meeting deciding whether they should be elected. At a meeting with the EMBA Superintendent to discuss choosing a new Pastor the sum of £350 p.a. stipend was considered reasonably satisfactory. It was also agreed that the church heating needed some re-designing. Rewiring and lighting, a vestibule at the top of the stairs and rehanging the door outwards was carried out in order to obtain a Theatre Licence. An amplifier system was purchased for £5 10/- afer the Deacons had heard one in action. At the same time repairs to the manse were needed. In September 1951 it was felt that a midweek meeting of the Fellowship should be tried - called "Church Family Circle". It would meet on Mondays at 8pm, open to all over 14, starting with devotional prayers. Plans for this were explained at the Harvest Social on 5th September. Samples of a newsletter as published by London Road Baptist Church were read and it was decided that such a publication would be of great help in the development of Church Family Life. A quotation from the Freeman Press (£3 6s for 300 size 10” x 8” and £2 2s 6d for size 8” x 5” was accepted. It was hoped that the 1st news letter would be ready on 1st December and the following organisation was formed - Literary Editor Dr H M Foston, Business Editor - Mr Barry Mills, Correspondents: Sunday School - Mr Maurice Hillier, Primary - Mrs Carrington, Sisterhood - Mrs Boon, Choir - Mr David Corah, BMS - Miss Boon, Renovating Fund - Mr Herbert Marvin, Children's Corner - Mrs Anderson. Also 23 distributors were appointed who were willing to distribute the newsletter personally. At this point Mr Frank Buckley took an interest in the Sunday School and hoped that, with the help of God, his activities would lead to an expansion of the Sunday School which was desired by all. Mr Gough suggested that felt runners would add to the comfort of the pews and it was resolved to ask for prices and Mr Ellis reported that improved lighting and seating accommodation would be more conducive to comfort. 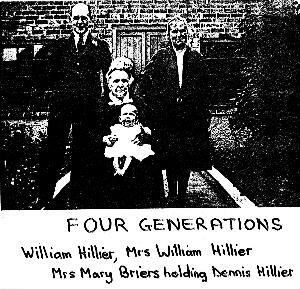 Rev Hinder left on 1 July 1951 to take over the Pastorate at Yardley Wood Baptist church. The secretary reported in April 1952 that he had personally delivered a warm invitation to Dr Alexander McCrae to visit the church with a view to the pastorate and the invitation had been accepted. It was resolved to decorate the minister’s vestry as soon as possible as it was very dilapidated. A letter was received in December 1952 from Shepshed Building Society stating their interest in buying land for the erection of offices. Following a request for more details the plans were demonstrated in January 1953. It was to be a one storey building with no lights to the church side. The building would be 4ft inside the present wall which would be taken down allowing us the use of the extra space. It was decided to recommend to the church meeting that we sell for £500 and the Building Society to pay all costs. The Coronation of Queen Elizabeth II took place on June 2nd 1953. On the preceding Sunday, May 31st, there was a special Coronation Service. In the evening the Junior Christian Endeavour presented a Coronation Pageant. Models of the regalia used in Westminster Abbey figured in it, and helped them to appreciate religious significance of the Coronation Service on the following Tuesday. It was hoped that all families associated with the church would be present so that this service in which the children would take so prominent a part would be a FAMILY Coronation Service. In October 1953 the Deacons decided that visual aids in church were not just 'frills' but were valuable for instruction and in evangelism and it was decided to purchase a filmstrip projector at the cost of £30. For various reasons not mentioned the news letter was suspended in 1955. 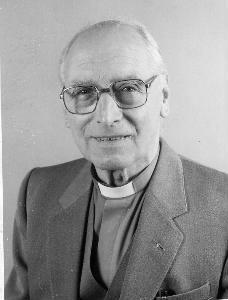 Rev R H Wheatcroft came to us as Pastor in 1958. 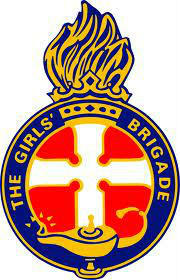 In January 1962 three organisations for young people commenced. These covered age groups from 8-11 (Happy Hour) meeting 6.45 pm on Wednesdays; 12-15 (Young People’s Fellowship) meeting on Fridays; and 16+ (Young People’s Group) which met once a fortnight on Wednesday evenings at the Manse. A Sunday morning crèche started in 1963 for children under 5 years of age; hopefully to encourage parents of young children to attend and stay for the whole service. Leaning on Thee, lord, for our every need. Witnessing daily for others to see. 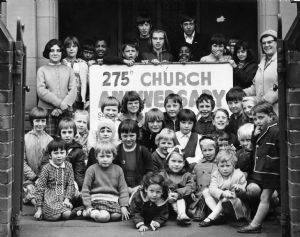 The church celebrated their 275th Anniversary in April 1968. April 1969 saw the end classroom being adapted to make a kitchen. The Church purchased a strip of land to improve access to the Manse garage and to make land at the side of the premises into a car park. Total cost of these two necessary improvements were in the region of £600. A Christmas fair was held on 1st November to help raise the money for this. The Sisterhood celebrated its 50th Anniversary in April 1970. The newly formed Men's Fellowship started meeting in September 1970. Minister’s letter - June 1970 Newsletter - 350th Anniversary of the sailing of the Pilgrim Fathers. "In 1620 about 120 men, women and children sailed from Plymouth in a ship called the “Mayflower” to settle on the bleak coast of North America. It has been said “this was one of the great events in the annals of the English race…. It was by their faith in God’s help and blessing and by the courage with which they bore hardships and faced dangers that the men who sailed in the “Mayflower” won undying fame." Because of the national emergency and consequent black-out of many streets in Shepshed during January 1974, it was decided to hold the second service on Sundays at 3.15 pm until further notice. During the week October 20th - 26th the Clergy and Ministers of the Shepshed churches were responsible for the “Thought for the Day” programmes on Radio Leicester. The themes and speakers were :- “The presence of God in Worship” – Rev S Harris; “The presence of God in Nature” – Rev R Snowsell; “The presence of God in other people” – Rev R Smith; “The presence of God in Suffering” – Rev J Frostick; “The presence of God in joy” – Capt Lynes (SA); “The presence of God in Work” – Mr S Seaton (Chairman Shepshed C C ); “The presence of God in Leisure” – Rev Dr D Spriggs. The organ broke down in December and needed a new motor. It could be pumped manually and this arduous task was undertaken for some of the services. MInister's letter on the occasion of the publication of the 'Good News Bible' in October 1976. On January 14 1978 there were many presentations to Rev. S Harris and his wife by churches and other organisations in and around Shepshed on the occasion of his retirement to Droitwich. Speakers said that Rev. Harris during his 9½ years in Shepshed had helped quite a lot in furthering inter-church goodwill and praised Mr and Mrs Harris for their very able ministrations over the years. Rev. S Harris preached his retirement sermons on Sunday 15 January and present at the evening service were the Mayor and Mayoress of Charnwood, Councillor and Mrs John Bradley. 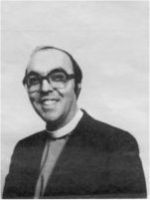 The weekend of 28/29th January 1978 saw the Rev Tony Wilson, from Wales, visiting the church to preach with a view to the ministry. On the Saturday there was a social evening for the fellowship to meet Rev and Mrs Wilson personally and on the Sunday Rev Wilson lead the services. At the short church meeting the following Tuesday January 31st it was unanimously agreed that the Rev A J Wilson should be invited to become our minister. It would seem that long and disruptive interregnums have ceased to be fashionable at Charnwood Road. On February 12th it was announced that he had accepted the pastorate to start at his induction on June 24th. A new inititaive began in May 1978 when local churches realised that they needed to go out into the community to encourage folk to attend church and find out why they didn't. Quite simply, people from the churches would take a street or just a few houses, working in twos or on their own as they prefer, and just show that the churches are there and have something to offer. Training was given so that people would have some idea what to say and how to go about it. The visits took place between 2nd– 5th May. Before the visits an introductory leaflet was put through doors. June 1978 - Looking back on 285 years; this church of ours originated not in Charnwood Road but in Chapel Street. It has to do with people rather than bricks and mortar. It came into being 285 years ago. These facts achieved prominence on Sunday May 7th when the Rev John Nicholson M.A. of Manchester conducted our church anniversary services. In the evening, this same minister preached from the text, “Jesus Christ, the same yesterday, today and forever”, and amongst those listening intently to his very able remarks was Mrs Edith A Hodgkinson, a widow of the First World War who tells us that she has been connected with our assembly for 80 years. Also in the congregation was the Rev FG Parker, our guest preacher’s uncle who had chosen a pew near the pulpit – and was sitting as straight as a ramrod despite his great age! Formerly a minister at Charnwood Road, it was the Rev Parker who officiated at the funeral of Mrs Mary Briers, a church stalwart of the past whose parents had worshipped at the old meeting house in Chapel Street. Mrs Briers died in 1937. Her church connexions spanned a period of something like 90 years. She was justly proud of her wonderful record – and of the fact that she was enrolled in the Sunday School at the age of 2. Like all old people she loved to reminisce and could recall when baptisms took place in the stream which flows at the rear of our church. Recordings of the services began on September 3rd and were available to anyone who wished to have them on loan. On July 22nd 1979 morning communion commenced to be held usually on third Sunday of the month . The kitchen renovation - repairs and redecoration and new equipment was completed in 1980 due to the hard work of Brian Bontoft and his team of decorators, with the fairhful copper having been honourably retired! The carpet tiles had already been bought some time previously; towards which many people helped by “buying a tile” at 35p per tile with their name inscribed on it. Two hundred years ago in 1780, Robert Raikes collaborated with the Rev Thomas Stock to found a Sunday school in Sooty Alley Gloucester. Raikes was concerned about the children and young people he saw running wild in the streets of his city, who had little incentive to better themselves. He saw the potential of gathering children into a school on Sundays to teach them to read, and he used his influence and his newspaper to promote the cause. Rev DR Hughes from Belper joined us as pastor with his induction held on January 15th 1982. During his pastorate the church organ needed repairing at a cost of £5000 and a sponsored silence was held in April 1982 to raise funds. 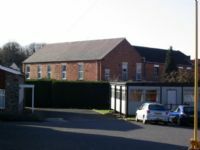 A lot of refurbisment of the the church including redecorating of the interior of the church, replacement of hearing equipment, oak doors (donated by Mrs C Platts) fitted to front of church, oak door to choir vestry (Mr & Mrs Anderson), carpets to upper school room, primary room, vestibule and foyer took place and also repairs made to the Manse together with the puchase of a garage for the minister. Rev Hughes left Charnwood Road for Princes Risborough in Buckinghamshire on August 26th 1986. Dr. Brewer acted as moderator till 1988 during which time in 1986 damage caused by flood cost £1096.02 to fix including rebuilding of wall at rear. A grant for the Manse of £3600 was received and new windows, pointing up and new damp proof course was carried out. The Youth Club removed old wooden shed and started to clear the Manse Garden. New stairs were fitted to the upper school room paid for by Ladies Craft Workshop. 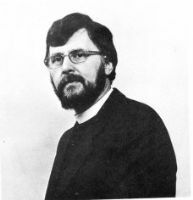 Rev Frank Foxall took up office as Pastor in October 1988. In 1989 the upper school room windows were replaced and a new side door fitted to the church. The church by now was on a Home Mission Grant. Betty Lou and Russell Mills visited for a week-long Mission during September 1989. During 1990 the downstairs rooms were damp-proofed and the brickwork was repointed. Bob Gordon and his team visited us for several days in October 1990. A Mums and Toddlers Group was formed meeting weekly in the upper hall on Wednesday mornings. Coffee mornings were also started on Saturday mornings. Both events were very popular and well attended. . Also formed was a monthly Luncheon Club which catered for the over 60s and met on the first Friday of each month. It was very much appreciated by those attending and looked forward to each month. In 1993 we celebrated the 300th Anniversary of the founding of the church with an exhibition of items from our history followed by a service and a tea in the upper hall which was very well attended by visitors from local churches and former attendees of our church. For quite a few years members of the fellowship enjoyed holidays in Llandudno and Scarborough. A couple of minibuses were hired and we visited many places in North Wales and in the Yorkshire areas, driven by our Pastor Frank and Mr Alan Todhunter. Rev Frank Foxall retired in October 2003 and returned to Shropshire after 15 years service at CRBC.